Earlier this week a person claiming to work for mega gaming chain GameStop posted a warning on Reddit to all prospective shoppers: if you sign up for a Game Informer subscription while you're at the shop, you will be signed up for a digital subscription, not for the print magazine—unless you ask. Worse, the person wrote, people who already subscribed to GI through their PowerUp reward program would be renewed as digital subscribers even if they'd been getting physical copies of the magazine. GameStop is indeed pushing digital subscriptions more aggressively and will start new subscribers on digital only, a company representative tells Kotaku. But they won't actually switch print subscribers to digital subscribers. "Our stores display both versions at the register and, if no preference is indicated, we will sign up new members with Game Informer Digital to deliver the best content and experience," a GameStop rep said in an e-mailed statement. "PowerUp membership renewals will continue with the customer's previously selected format. We are committed to delivering Game Informer through the channel our loyal customers want to use. We understand that many gamers prefer to access the digital version while others prefer the traditional magazine." The Redditor had cautioned print subscribers to watch out for a switch: "That's right: even you folks who have ALREADY TOLD US you want a print copy, if you renew your card, you will be signed up for a digital sub unless you explicitly ask for the physical copy." But when asked about that exact scenario, a company rep told Kotaku last night that print subscribers will have to take no special action when they renew their subscription to keep being print subscribers. Game Informer subscriptions have long been part of the GameStop shopping experience. Signing up for the retail chain's used-game discount program and its rewards system meant getting a sub to GI as well, helping the magazine maintain its ranking as one of the most widely read magazines of any type in America. Digital subscriptions to the magazine present the entire contents of the magazine online, sparing GI the costs of paper and shipping. Depending on your point of view, digital subs give gamers the freer experience of reading digitally or the aggravation of having nothing to dog-ear. UPDATE: Some readers are saying that they have in fact been switched from print to digital subscriptions while renewing, without warning. Others say they were warned. I'm checking back in with GameStop to see what the deal is. UPDATE 2 Pressed about the discrepancy between their stated policy and the experience of some of our readers who said they were switched from print to digital without warning, a GameStop rep told me today that their "original response is the policy. 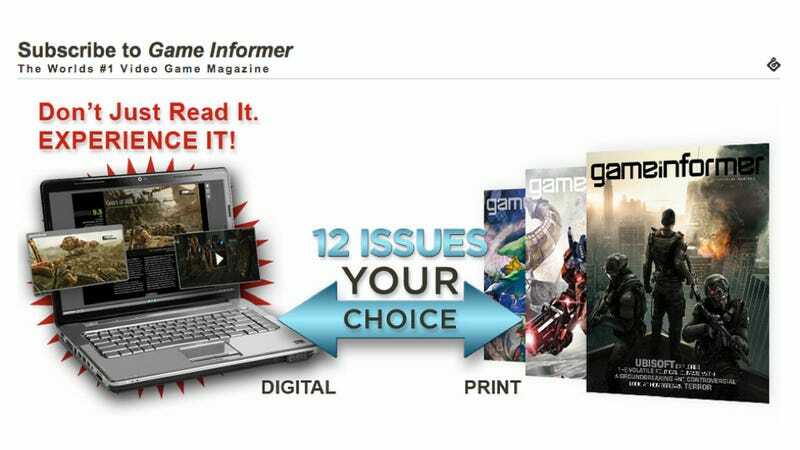 Subscribers may, at any time, contact Game Informer to switch their current subscription from one format to the other by visiting http://gameinformer.com/contactus.aspx or calling 866-844-GAME." Several commenters as well as readers who have contacted me privately say their experience as GameStop customers and employees has involved a mixed execution of that policy, with some store managers encouraging employees to make sure customers have a choice and others pushing a switch to digital on the sly. "At least in my district, our [district manager] wants us to just renew the customer with a digital sub and mention it's a digital sub and explain all the benefits. However, if the customer challenges and asks for a printed subscription, then we give them one. I don't know whether this was from higher up or just from the DM to make numbers look better to corporate. Against my DM's wishes and to be fair to the customer, I always ask the customer what their preference is. I'm not sure what the corporate policy is though. "Also, we never were told to unknowingly switch customers. However, the default selection for renewing on the POS computer screen is the digital option. So if the employee is not paying attention or just quickly accepts the defaults, I can see how customers can be 'switched' without ever being asked. Unfortunately I have seen this happen first hand." The motivation to sell readers on digital subs, the GameStop workers say, is expense. One worker said the digital copies cost the company 50 cents per issue to fulfill as opposed to $5 per print issue. Digital subs contain all print contents plus online video content.